Not a bad little park but a bit hard to find. Sites are cement but close together. Our site was high in the front which was a pain because our 5th wheel sits high connected to the truck and we didn't want to disconnect. Water was not working when we arrived so many of the tennants were out and we found everyone friendly. The problem was a city pipe leak and was fixed in a couple of hours. All communication with the office is via voice mail and the lady we dealt with was not consistent about listening to her voice mail or promptly returning calls. But we were able to get business done. Recommend for overnight stays only. We camped at Gaslight Square Mobile Home Park in a Fifth Wheel. Easy access to I-10 and like 20 min to downtown El Paso, but still relatively quiet, it was great for an overnight. The park is small and spacing is somewhat close, but all level concrete with good utilities and very clean. Not a lot of shade but there are a few trees. Although the office was closed on Sat, a manager came out to see if we needed anything, so we gave him payment info. VzW is strong, but I can't comment on the WiFi because I forgot to ask for the password. We camped at Gaslight Square Mobile Home Park in a Fifth Wheel. We stayed here years ago but got into the habit of staying at a nearby park, until their rates skyrocketed and we decided to come back here. Office people were very nice, as were all the neighbors we met during our 2 week stay. Our site was a very easy pull through, even for a big rig, and even has a tree! We wouldn't hesitate to come back. The price is right, it isn't too far from the highway, and its very convenient for El Paso. 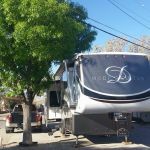 We camped at Gaslight Square Mobile Home Park in a Fifth Wheel.